Resistance measurements were made as a funcIon of temperature and magneIc field on a 6 mm long Ga-­‐In eutecIc nanowire confined in a hollow glass fiber of 150nm inner diameter. Novel hystereIc switching between stable superconducIng and resisIve states are seen. 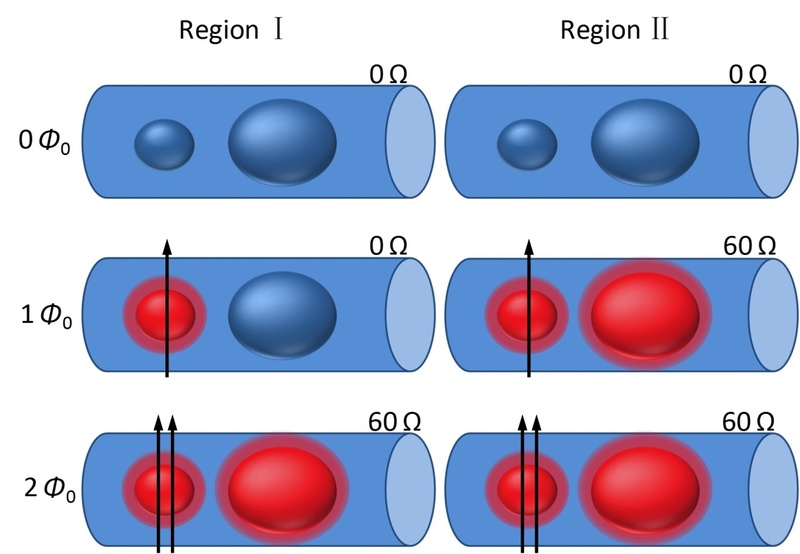 The nonzero resistance occurs when a Ga nanodroplet spontaneously formed along the length of the nanowire traps one or more superconducIng fluxons, thereby driving a Josephson weak-­‐link created by a second nearby Ga nanodroplet normal. This experiment opens the possibility of developing single-­‐fluxon logic and memory devices.